In his introduction, Prof. Hess pointed out that a resurgence of manufacturing, or “re-industrialization”, has in recent years been incorporated into economic development strategies of many high-income countries. To keep the EU member states competitive in the global economy and bring back manufacturing on the qualitatively higher level, the European Union has intensified research, supported clusters and networks and launched the Innovation Union and the Single Digital Market initiatives as a part of its Europe 2020 strategy. In a similar way, China has put forward its ‘Made in China 2025’ strategy with a strong emphasis on smart and sophisticated technologies so as to give new impetus to industrial production and further climb up the value chain. All the strategies and initiatives have one thing in common – the focus on “Industry 4.0”. The term was first used in 2011 at the Hannover Fair and has since become popularized in Germany. Industry 4.0 is based on the automation of production and the use of digital technologies which enable machines and devices to connect and communicate via the Internet of Things (IoT), as well as self-diagnose and optimize work flows. It is believed that such ‘cyber-physical systems’ would increase efficiency, make production more beneficial to the environment, and ‘relieve’ workers from repetitive jobs. The manufacturing sector is also transforming from mass production to greater customization of products, in locations closer to customers and end users. The development of Industry 4.0 in Europe entails investment in research and new technologies, which require substantial financial support and combined efforts at international, national and subnational levels. In Germany and Austria, among others, the federal governments, industry and universities are already running a number of joint model projects and have intensified research in so-called R&D ‘excellence clusters’. The seminar discussed features and implications of the Industry 4.0 concepts on urban development, and the significance of support and investment in latest technologies on the economy of cities like Vienna and Hong Kong. The perspectives appear to be widely diverging. Whereas Europe appear to be concerned foremost with the effects of ‘Industry 4.0’ on the number of jobs available, Hong Kong emphasizes efficiency and productivity gains in a situation of already existing labor shortages. Mr. Roland Sommer said that Industry 4.0 is often called the 4th Industrial Revolution. It affects business across entire value-chains and covers smart production, smart products and smart services. He explained that Industry 4.0 requires an entire ‘system innovation’ including a rethinking of policy making, and a horizontal approach to tackle systemic problems (e.g. e-mobility, smart housing). In order to take such a wide angle, cities have to involve actors outside the government, ensure long-term planning strategies, adjust regulations and strengthen social innovations. It is also important to acknowledge that complex societal problems can be addressed with new technologies, but social acceptance would be crucial for this process. System innovation is characterized by disruption and demand for new types of knowledge and technical skills, fundamental changes in consumer practices and markets (some areas are now more digitalized than others) and novel types of physical infrastructure (e.g. broadband networks) and the educational system, which has to adapt to digitalization. The media sector has already become fully digital and is being followed by retail, telecoms, insurance and banking. Other sectors such as consumer packaged goods, the automotive sector, logistics, health care and energy have some components of digitalization but ‘are not yet there’. Smart specialization is another concept playing an important role in support of innovation in the European context. It combines industrial, educational and innovation policies and requires regions to identify priority areas for knowledge-based investments, in accordance with their unique comparative advantage. In Hong Kong, for example, the banking sector and logistics play this kind of strategic role. Smart specialization implies more effective spending of public resources as they are directed towards specific priority areas. There is a need to create synergies between public support for R&D and innovation, industrial promotion and training institutions. Existing policy fragmentation and the duplication of R&D should be eliminated. This requires an analysis of the capabilities and strengths of a city/region/country so as to identify areas in which entrepreneurship and multiple government institutions can communicate and jointly map, benchmark and monitor development clusters. With regard to the adoption of new technologies, Industry 4.0 is not only evolving around the Internet of Things (for communication between machines) but also the Internet of People (IoP) and the Internet of Services (IoS). Machines communicate with people, and the technology is used for people-to-people services, while all of them merge into the Internet of Everything (IoE). It brings new challenges for structuring, combining and comparing different types of data. Industry 4.0 transforms production processes by introducing flexible production facilities able to produce a broad variety of products, which are increasingly individualized. This requires agile, ad hoc planning capabilities and the rapid integration of new procedures and technologies. This, in turn, will be possible only with new employee qualifications, new industrial ICT (including web technologies) and new business models. Productivity gains can be obtained by shifting from hardware to software (e.g. in the automotive, machinery and agricultural sectors), from product to service (e.g. car-sharing) and from product to network. IoT platforms constitute an ecosystem for device management, application enablement/development and network management. Business processes can be redesigned with information and knowledge obtained from collected field data, combined with real-time Key Performance Indicators (KPI) analysis. Mr. Sommer comprehensively described how to build up an interlinked ecosystem for Industry 4.0 with instruments at the international, national and regional/local level. Universities are extremely important in this process. They provide research in areas such as production technology, IT, mechatronics, data management, etc., and transfer it to new products and services. Therefore, a broad research infrastructure is needed. One example is a pilot factory in Vienna (Aspern), which uses 3D printing technology and simulates production processes developed by students. This allows insights how production will work in fully digital environments. The factory can also be used by SMEs trying to test optimal modernization of their existing production lines. Research funding instruments such as Horizon 2020 at the European level (the largest R&D programme in the world, with over 70 billion euros for 7 years), national programmes for production and innovation, and regional schemes for SMEs and the education sector have been launched to further strengthen research capabilities. Applied universities with strong links to local enterprises provide training and equip students with practical knowledge in smart engineering, web business and technology, embedded systems, and mechatronics so as to allow quick transfer of students to the industry upon completion of their studies. Nationally, tax incentives can be helpful to boost Industry 4.0 development. Austria, for example grants tax concessions of HK$12 for every HK$100 invested in R&D to universities and companies (including high risk research). Regionally/locally, it is essential to have start-up support in the form of dedicated funding, venture capital, and networking events. Mr. Sommer argued that smooth knowledge transfer is extremely important, for example via regional initiatives bringing people from industry and research together. The Industry 4.0 Platform in Austria intends to improve the framework conditions for the digitalization of industry and involve policymakers and all other major stakeholders. Its regional platform focuses on Smart Specialisation. At the international level, the European Commission provides a further umbrella framework for all initiatives in Europe through its Digital Agenda. Human resources at the national level need changes in labor regulations (flexible working arrangements), while the regions should arrange for more individualized training for employees. In Austria, for example, the development of a highly-skilled workforce in Austria is being supported not only by universities and vocational schools, but also through the dual system of training. In this system, part of a training course is completed at school, while the other part consists of real working experience in a company. Mr. Sommer said that there is high demand for professional key competences in areas such as Web 2.0 and CPS systems development, additive production, 3D printing, robotics, and wearables. Cross competences require knowledge of big data handling, interdisciplinary cooperation, and the design of innovations. Most most important are self-competences such as independent individual learning (‘life-long learning’) and a willingness to take on responsibility for the operation of production. To complete this ecosystem, Industry 4.0 needs to be regulated by international norms and standards. At the beginning of his presentation, Dr. Lawrence Cheung reminded the audience that Industry 4.0 is not limited to manufacturing only, but at the same time covers other sectors and the entire supply chain. It also affects people’s everyday life. He illustrated the social and cultural impact of industrial revolutions with an example of Mozart and the production of pianos. In Mozart’s time, the piano was a luxury product owned only by the elite. When mass production became possible, it changed to a commodity affordable to a broad spectrum of people. Each step in the evolution of the industrial revolutions had a technological enabler. The first industrial revolution had the steam engine, the second happened when electricity and the production line were invented. The third revolution can be characterized by electronics, robotics and automated machinery (though each machine still working independently). The fourth industrial revolution, in turn, relies on communication technology and machine intelligence. Despite assigning different labels to the process, many places in Asia are currently supporting re-industrialization and Industry 4.0. Examples could be found in China, Hong Kong, Japan, South Korea or Taiwan. The development here is driven by market forces such as globalization and individualization (focus on specialized production, knowledge of customers’ needs), but even more importantly by high automation and connectivity. Dr. Cheung said that Hong Kong has an advantage in the drive towards Industry 4.0 due to its strong IT and telecommunication infrastructure, free flow of data, vibrant retail sector, solid legal frameworks, and its well-established position in global supply chains. There are also large manufacturing facilities across the border in China owned by people from Hong Kong, and the city is a logistic hub. Besides all these factors working as competitive advantages, there are several challenges. Hong Kong industrial enterprises, for example, do not have their own brands and normally produce for foreign companies. This may limit their freedom to change design and production processes. There is also a lack of in-depth knowledge on how to deploy Industry 4.0 technology and the erroneous conviction that Industry 4.0 always involves heavy investment in hardware and software. However, foreign buyers are gradually starting to impose elements of Industry 4.0 as contractual requirements. The Hong Kong Productivity Council (HKPC) helps people and enterprises adapt to Industry 4.0 and create new technologies. It collaborates with the Fraunhofer IPT Institute of Germany, providing certified competency training for CEOs, managers and implementation teams on how to facilitate Industry 4.0. Beside training and conferences, HKPC helps enterprises carry out assessments of Industry 4.0 capabilities and maturity, develop strategic roadmaps, implement pilot projects, and enter a smart enterprise certification programme. A ‘Smart Industry One’ consortium will be set up grouping manufacturers, users, and IT vendors, with the HKPC as a connector. A new facility will be also created locally to showcase Industry 4.0 operations. The transformation toward Industry 4.0 will depend on the further development of technologies such as intelligent robotics (robots able to sense the environment and interact with humans), big data, cyber security, and 3D printing. Dr. Cheung said the shift to Industry 4.0 will be a gradual process and leave enough time for skills adjustments. The need for a ‘human touch’ in production will still persist. Mr. Simon Wong provided numerous concrete examples of the application of new technologies in the Hong Kong logistics industry supply chains, based on the work of the Hong Kong R&D Centre for Logistics and Supply Chain Management Enabling Technologies (LSCM). Hong Kong industry is currently being challenged by the emergence of e –commerce which requires completely new supply chain models, a shift to more flexible and agile production, a local shortage of labor, imbalances due to order fluctuations (difficult to plan production cycles, especially in e-commerce). There are few industrial activities left in Hong Kong due to the relocation of factories to China. Only 2% of Hong Kong’s current GDP comes from manufacturing, and a debate on re-industrialization has already started. Examples from Europe show that there is a possibility for decent manufacturing even in cities like Hong Kong, potentially in medical products or in other specialized sectors. Hong Kong has an advantage in IP protection, efficient shipment to international markets, easy regulatory approvals, high research capacity in some specific areas, world-class telecom and logistics infrastructure, and a well-established international commercial network. In the field of robotics, LSCM is helping SMEs deal with e-commerce by testing autonomous vehicles in sorting, picking up and placing items in warehouses. Other project takes place at the Hong Kong airport, where robots could reduce labor demand in cleaning, security checks and customer service. There are already automatic conveyors for luggage handling, auto label dispenser for RFID labels, and luggage transport to the gates. A recognition and analytics-based trolley management system and smart counter assignment systems can help improve customer service. Disc-shaped devices with RFDI antennae can further obtain information about every piece of luggage being loaded into containers which transport them to aircraft. Another area in which new technologies make a big impact in Hong Kong is virtual reality training for, for example, operating port containers and air-cargo terminals. In the public sector, HK customs already uses electronic locks, RFID and GPS tracking without boundary stopovers. New services are provided to logistics SMEs, for example a platform helping them locate warehouses in China. Warehouses operations are being improved with IoT devices used for stock count, humidity check, and wireless electronic shelf labels. Hong Kong also enjoys high accuracy of GPS software used for location and surveying, as well as satellite remote sensing technology services. Mr. Wong provided examples of government funding for research such as the Innovation and Technology Fund, the University-Industry Collaboration Programme, and the Sector Trial Scheme for the testing of products in government departments and public bodies. Hong Kong companies are eligible to join the Enterprise Support Scheme and the R&D Cash Rebate Scheme. Start-ups are also in the spotlight, with the support of incubation programmes at the Hong Kong Science and Technology Park and Cyberport. The speakers discussed solutions for one of the most critical problems at the moment: the lack of high-skilled personnel (in particular software and hardware engineers) capable to deal with Industry 4.0 and related enabling technologies. They agreed that it cannot be solved immediately. According to Dr. Cheung, the focus should be on education and training. There is a need to attract more young people to engineering and IT studies, demonstrate future employment perspectives and show that Industry 4.0 is more than physical labor on factory floors. There should be more possibilities for retraining on offer. Mr. Sommer pointed to the importance of vocational training schemes, close links between universities and the industry, as well as bottom-up initiatives (i.e. a group of start-ups creating an academy for training in specific skills). In Austria, there are numerous initiatives promoting STEM education at school, but there is no one umbrella institution coordinating them. Nonetheless, Vienna has an advantage with the prevailing dual-training approach. Mr. Wong said that every production requires several tiers of talents. 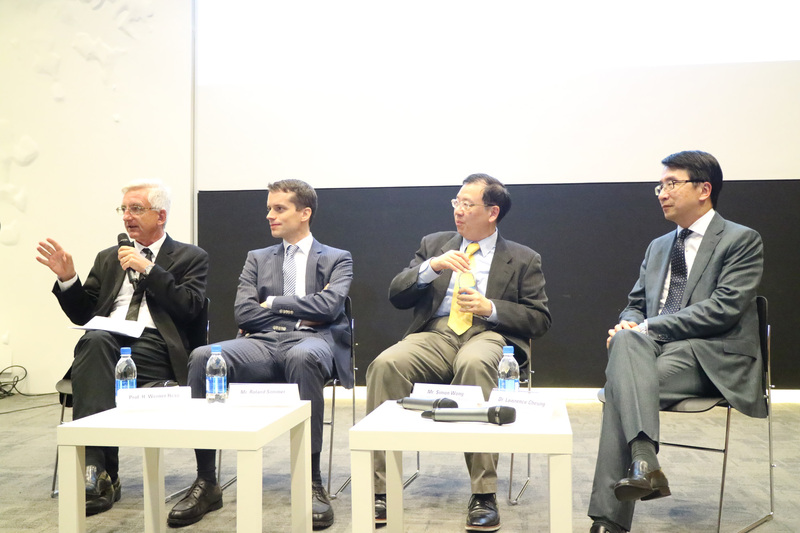 While Hong Kong and other places cannot fill them, they have to attract experts from abroad. There are also skilled workers from Hong Kong being employed in China for highly specialized production who could come back to support local industry development. As manufacturing requires space, Hong Kong with its high rents and high cost of living may find it difficult to compete with other cheaper countries in Asia. Thus one of the key questions now is to ensure that companies want to stay instead of moving abroad. Mr. Sommer mentioned an example from Barcelona which created a special development area in which 20% of gross floor space is dedicated to manufacturing with guaranteed low rents. A similar initiative was launched successful in Graz in Austria. In compliance with the high environmental standards in Europe, there must be a strong focus on green industry and manufacturing with hardly any emissions. Mr. Wong said the division of labor within supply chains has changed greatly. Now that goods are shipped directly through e-commerce, everyone can produce goods with 3D printers without having to set up an entire ‘factory’ of the traditional type. Production can be highly customized, and there are sectors of manufacturing which do not require a lot of space, but rather sophisticated technology (e.g. the production of sensors or medicine). The speakers also discussed social aspects of Industry 4.0 and whether it can contribute to social justice at a time when large numbers of jobs are disappearing worldwide and rightwing politicians in the USA and Europe offer populist ‘solutions’ to ensuing complex social problems. Mr. Sommer said that there is a lot of uncertainty on what will be the jobs of the future and whether robots will replace or help humans. In Europe, robots are used to help humans and the strengths of both sides are acknowledged. Mr. Wong mentioned that robotics and automation can help improve people’s lives, especially when the population is ageing and there are not enough helpers to meet the needs of the elderly. He also added that innovation itself does not cause inequality but it is important how it is used. Before, sharing of wealth was easier when factories used to hire a lot of people, but now companies worth billions have just a handful of employees. For instance, a smartphone application or a game made by only a dozen co-workers can attract millions of users and billions in revenue, while factories, even those for highly specialized products, will hire at least several dozen employees. Finally, automation cannot be pushed forward without at the same time safeguarding people’s livelihood and social policies which effectively reduce social inequality.